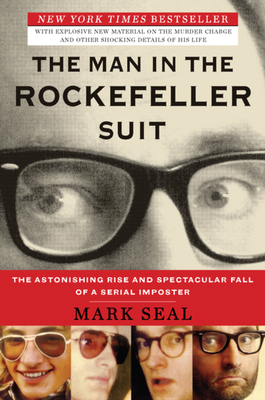 When I was pitched THE MAN IN THE ROCKEFELLER SUIT: THE ASTONISHING RISE AND SPECTACULAR FALL OF A SERIAL IMPOSTER by Mark Seal, I was surprised that I hadn't heard about this unbelievable story. I asked my husband if he was familiar with the story; and of course, he was. He had seen features on various new shows, so I figured it was time for me to become educated about the man who called himself "Clark Rockefeller." German born Christian Gerhartsreiter had been living in the United States for decades posing as different people... including Clark Rockefeller a member of the prestigious Rockefeller family. While some people found him to be a bit strange, Gerhartsreiter basically pulled off impersonating a distant Rockefeller cousin for almost twelve years. It wasn't until he kidnapped his daughter and then mysteriously disappeared that the police and FBI began investigating this very strange story. THE MAN IN THE ROCKEFELLER SUIT was an amazing book -- it was even an Edgar Award Finalist and People Magazine gave it four stars. I can honestly say that his story proves the saying that "truth is stranger than fiction." I admit that my initial reaction to the story was incredulity. I had a very hard time believing that one man could re-create himself so many times and fool so many people. I figured he was preying on the innocent and maybe not the sharpest tools in the shed, but in actuality, he conned so many professional and successful people (including his wife.) But you have to understand. This guy was good... really good. In fact, it makes me wonder how successful he could have been at something legitimate if he had used his intelligence and charm in a positive way. There is no doubt that Gerhartsreiter's story is amazing in any way, shape or form; however, I do think THE MAN IN THE ROCKEFELLER SUIT was very well written. I appreciated the way the author presented the story, and I liked his writing style. It was apparent that the book was thoroughly researched (the author even traveled to Gerhartreiter's hometown) and he also managed to interview many of the individuals who had met Gerhartsreiter and were conned by him. By reading their words about Gerhartsreiter's actions and their feelings about his duplicity, I got a better idea about how he operated. Furthermore, I thought this book demonstrated how people are willing to see and believe what they want to see and believe. There is little doubt that this man was extremely intelligent and was able to read people very effectively, but THE MAN IN THE ROCKEFELLER SUIT also pointed out some interesting things about basic human nature. I'm not sure that I initially considered THE MAN IN THE ROCKEFELLER SUIT as a book club selection, but I did find that there is a reading guide available; and that made me rethink things. After realizing that this book did have some intelligent insights into human behavior, I can see how people would want to discuss this story. Some of the topics you might want to explore -- besides what makes Gerhartsreiter tick-- include duplicity, dishonesty, gullibility, pressure, the American Dream, and trust. I thoroughly enjoyed THE MAN IN THE ROCKEFELLER SUIT and I definitely recommend it to fans of true crime stories. I am always drawn to the true story, particularly true crime. That way I get to Google pictures and stuff, and be amazed that this isn't just a figment of some author's imagination. I remember when Nicole reviewed this, and have had it on my list ever since. I've heard of several people pulling off cons like that and I just don't know how they do it. I'd be so nervous I'd probably slip up in a day or two. The book sounds fantastic! I liked this book too. Like you, I couldn't believe how many people he managed to fool. Especially his own wife!